Muscle Injuries in Football – Part 1: What are they? What do they mean? How are they classified? As we have seen in the first chapter, according to the UEFA Elite Club Injury Study Report 2016/17,muscle injuries represent about 45% of all injuries in football and it is expected that, during a season, approximately 37% of players miss training sessions or match due to these injuries. Because of this, and with the huge negative impact that results for the club, we have decided to explore this topic, to help to understand better what a muscle injury is, when and how does it occur and what can be done to prevent it from happening. Despite its high occurrence rate, the muscle injury is still a poorly understood entity or, at least, with a lot more to unveil, with its prevention being one of the biggest challenges that clubs’ health and performance related departments face. 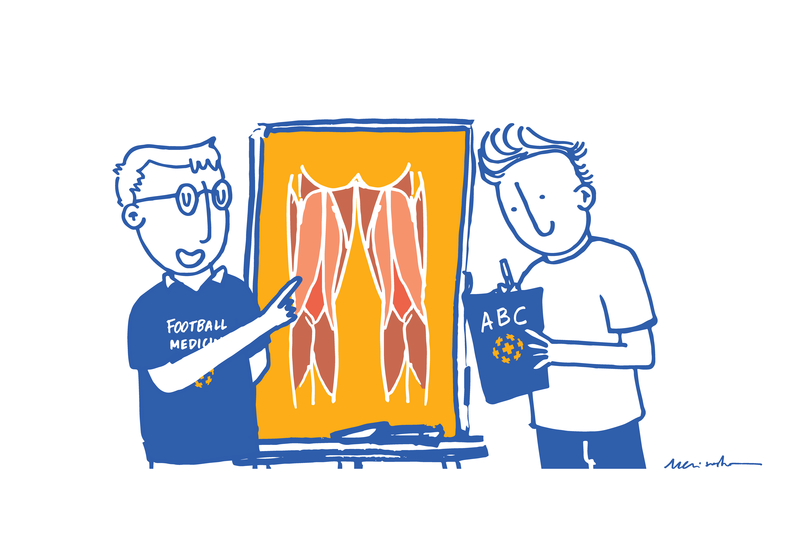 With that said, and keeping in mind that the primary goal of this project is to educate its readers towards the problems related to health in football and not to simply present recipe-like answers, the first step is to go a little bit deeper on some basic knowledges regarding this organ – the muscle – and this entity – the muscle injury– in order to better understand what strategies may be used to lower the risk of this injury to occur, and creating a logical reasoning on why muscle injuries prevention and treatment should follow certain approaches. 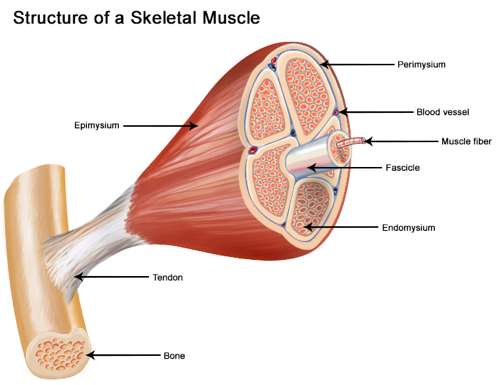 First, it is relevant to understand what “muscles” actually are, how they are composed and how they work. This will help to understand its frailty areas. There exist three types of muscle contractions: concentric, eccentric or isometric (explanation as seen in figure 3). 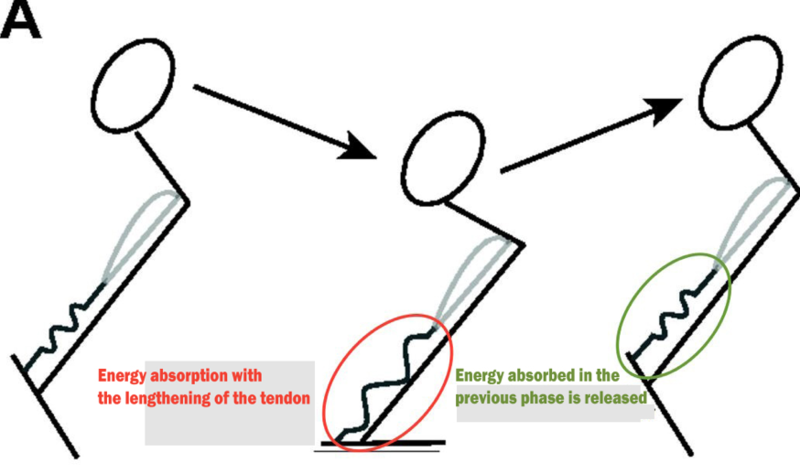 It is known that the most relevant type of contraction when it comes to muscle injuries in football is the eccentric, since not only is this the type of contraction that has the highest capacity to produce force, it is also where the connective tissue suffers more stress (the muscle fibers are contracting but the muscle globally is lengthening) (Figure 4). An example of this contraction is the one produced by the posterior thigh muscles (hamstrings) during the sprint. This is a task that requires a significant effort of these muscle do deaccelerate the lower limb movement, transitioning from the swing phase to the stance phase of the limb (“air” phase / ”support” phase, respectively). According to Bisciotti et al. (2013), a structural muscle injury can be classified as “an identified loss of muscle function due to damage, either light or severe, at the muscle structure or at other structures responsible for the force transmission”. Muscle injuries can be considered as “functional” or “structural”, where functional injuries are considered minor injuries – mostly induced by fatigue (e.g. often usually called “myalgias”). These are characterised by an increase in muscle tension and/or muscle pain but with no change in the structure of the muscle. This change in structureis what defines the structural muscle injury, where noticeable rupture of the muscle fibers occur, with discontinuity of the tissue. In Figure 5, we can see the muscle groups with highest injury rate in football, as well as its occurrence rate in the course of the game. We see a tendency to an increase in the number of injuries in the last moments of each half of the match, pointing out one of the key risk factors to muscle injury occurrence – deconditioning and/or fatigue. As you could expect, and since football in a sport with predominant use of lower limbs, the majority of injuries occur in the lower extremity. 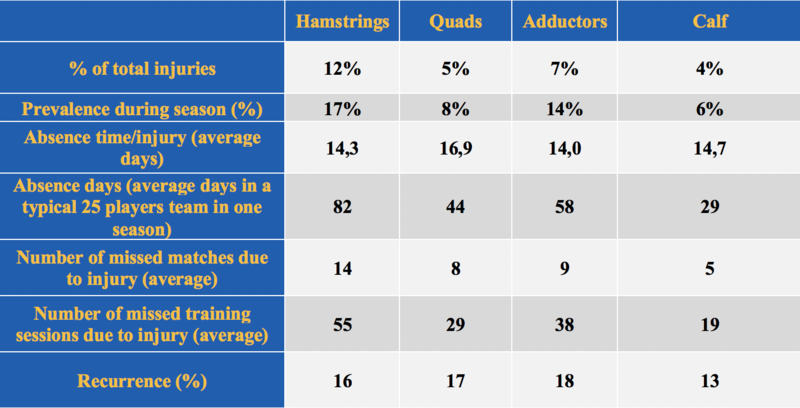 As stated in the UEFA Elite Club Injury Study Report 2016/17, up to 90% of the muscle injuries in football affect the four major muscle groups of the lower limb: hamstrings, quads, adductors and calf muscles. 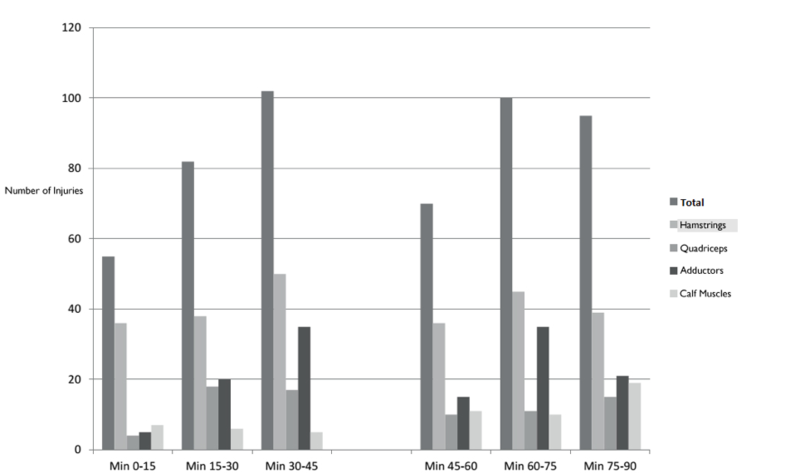 As seen in image 5, muscle injuries to the hamstring (posterior thigh) stand out as the most common injury, with 37% of the total of muscle injuries and 12% of all injuries in football. Muscle injuries can also be differentiated by its mechanism, between directand indirectinjuries. The latter occur without any influence of external trauma, resulting from the failure of “force absorption” or “force transmission” mechanisms and are, as seen by the table below, the most frequent in modern football(and, out of curiosity, also the ones that imply higher rehabilitation periods). Regarding direct muscle injuries, these are caused by external trauma (e.g. a knee blow to the thigh or the hit of the pointing studs that may result in laceration). Table 1 – Distribution, incidence and estimated recovery time – direct vs indirect injuries. One the first things that the different elements of a team want to know in the post-injury moment is its severity and the absence period it will require. This is probably, as we’ve mentioned before, the biggest challengefor the medical team: the injury prognosis. To tackle this, the existence of a classification system that supports the clinicians to identify/characterize/frame to injury is essential. 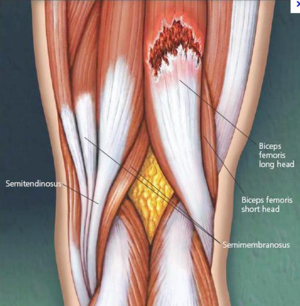 The muscle injury classification has suffered a continuous evolution through the times, ever since it was recognised that the muscle could suffer injuries in very specific and different regions, such as “where the muscle fibers merge to the tendon” (myotendinous junction), the “muscle belly” or the tendon. 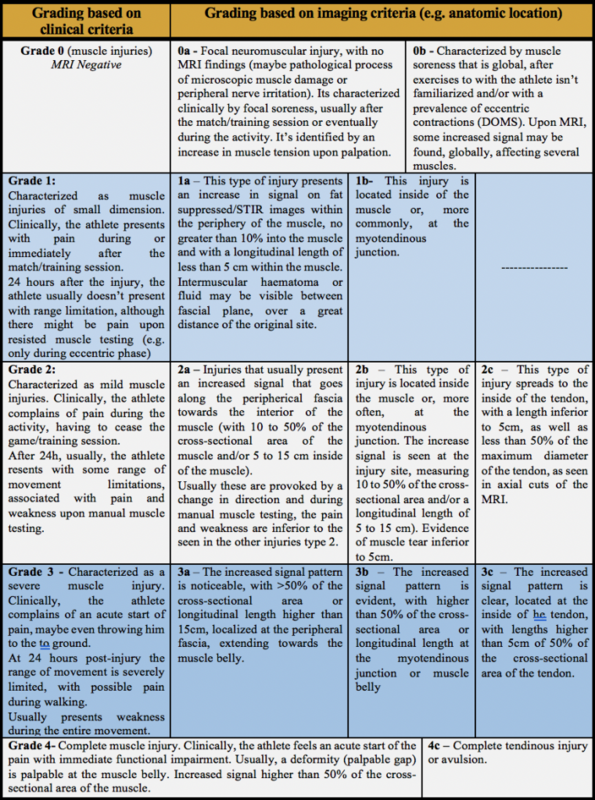 With the development and support of imaging technology (Ultrasound and MRI scans), which allowed to visualize directly the injury site, more precise description of the anatomic injury grades (Grade I, II and III) was developed, as seen in Table 3. Nevertheless, this classification (and as the previous clinical classifications), doesn’t offer any valid prognosis of the injury, presenting only a simple timeframe connecting the extent of the injury and the necessary time before return to competition. A recent concept that has been developed growingly in the clinical practice is the one of muscle injury grade 0 – MRInegative. (without visible changes upon MRI assessment). This type of injury represents an acute moment of pain, range of motion/strength deficit but in absence of imaging findings (at least, in the moment of the scan and with the technology that is commonly in use). The classification and consideration of this type of injury (“functional”, as previously stated) is of high clinical relevance, since there a better prognostic and faster return to play associated to these “non-structural injuries”, as demonstrated in Figure 6. 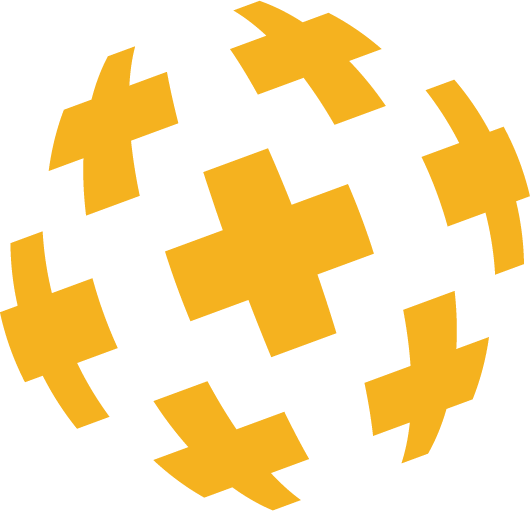 In order to answer the uncertainty associated to prognosis, a new classification system as risen. This system considers 5 grades of muscle injury (0-4 grades), with 1-4being subcategorized according to one of three anatomical sites (a, band c), according to the location and extent of the injury. There is evidence that injuries with intratendinous involvement have a worse prognosis, giving them the end position of this scale: “c”. With the same rationale, myofascial injuries(a) have, usually, a better prognostic than myotendinous injuries (b). 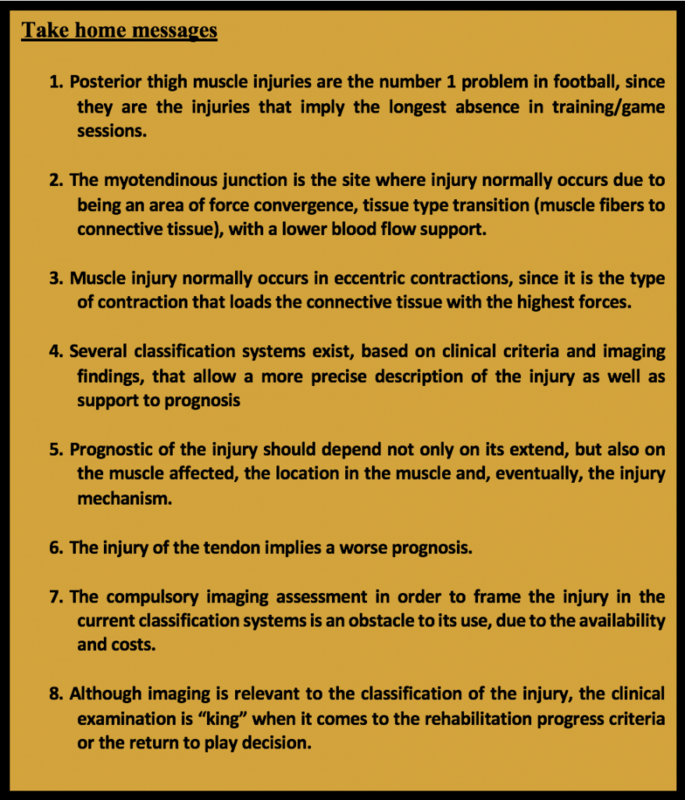 Muscle injury classification systems might be extremely complex for clinicians even, this way, and considering the purpose/target population of this project, we are leaving at the end of the article the most frequently used system nowadays for the most curious readers. Although, the imaging data can be relevant to support the initial good/bad prognostic,providing useful information to classify the severity of the muscle injury, this does not apply to the clinical monitorization of the rehabilitation of the injury. Reurink G, et al. (2014) demonstrated that 89% of the posterior thigh injuries presented clinical clearance to play but still showed MRI findings upon return to play. These finding underline the idea that although imaging may be fundamental to assess with precision the muscle injury, the results of these exams shouldn’t be valued over the clinical presentation of the player (clinical history and objective examination) during the progression of rehabilitation and/or return to play decision. When concerning to the initial assessment of the injury, we are faced with a dilemma: on one hand, imaging such as MRI are fundamental to classify the injury; on the other hand, the need to use these exams becomes an obstacle to the practice of this system, due to its cost for the club/athlete, turning it mostly availability for the elite football and not the majority in the sport. This is why, in further chapters, we will introduce some of the clinical criteria that, objectively and subjectively allow to support the prognosis in muscle injury in football. Thank you very much for your feedback Fernando. We truly hope you continue to follow it, ABC of Football Medicine® will be released 1 time every 2 months.